pcpioneershockey.com, Dane Ludolph is the team's leading scorer with 12 goals and 26 assists for 38 points. Brian Babbitt has 21 goals and 16 assists for 37 points. Among the team's bad boys, George Catrall is leading in penalty minutes with 64. Imonti and Levi Wegleitner each has 60 penalty minutes. If you can't make it to the Park City Ice Arena this weekend, how about Las Vegas in April? The Pioneers are scheduled to defend their Mountain West Hockey League championship there in the league tournament April 11-13. Imonti said he expects their toughest competition to come from the Vail Yeti. Also playing in the six-team tournament will be teams from Aspen, Salt Lake City, Las Vegas and San Diego. There aren't many people who come away from Las Vegas on a winning streak. The Park City Pioneers hope to be among the select few. Park City Pioneer forward Brian Babbittt carries the puck down the ice during a previous game against the San Diego Skates at the Park City Ice Arena; he's the team's second-leading scorer. The Park City Pioneers have lost only three games in league play this year. But their non-league games, well, that’s another story. 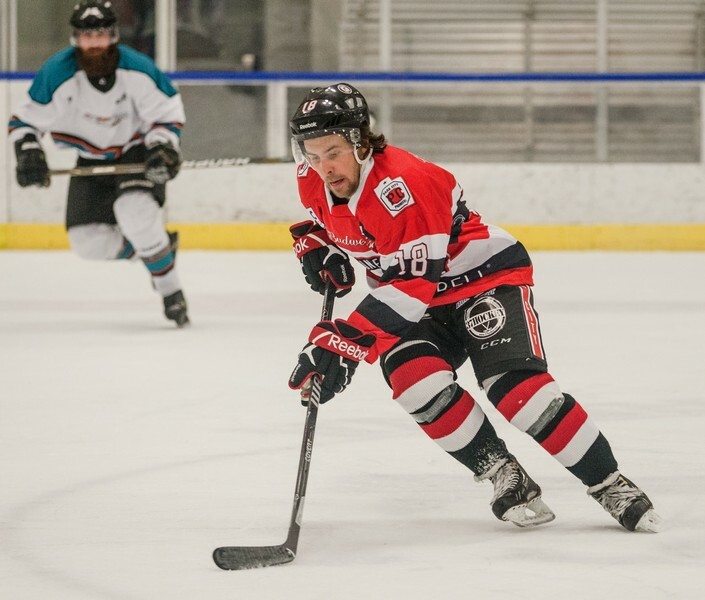 In a two-game series in Sun Valley last weekend, Park City’s semi-pro hockey team was pounded by scores of 11-2 and 10-0. That gave the Pioneers a 0-4 record against the Suns this season and dropped Park City’s record in independent games to 2-10. "Rough weekend," said Park City captain David Imonti. "It was probably two of our worst beatings of the year. "It wasn’t for lack of effort," he said. "For various reasons we were very shorthanded. We had to do with what we had, and what we had wasn’t much." With the schedule winding down, Imonti said this off-season might be the time to make some roster changes. "This year, for some reason, we haven’t been clicking the way we normally do." Imonti said the Pioneers hope to finish the regular season strong with a two-game series at home against the Jackson Hole Moose. Scheduled game times are 8:15 p.m. Friday and 7:15 p.m. Saturday. Proceeds will benefit the Park City Ice Miners. The Pioneers have yet to beat the Moose in four games this year. However, all four were played in Jackson Hole. According to the Pioneers’ website, pcpioneershockey.com, Dane Ludolph is the team’s leading scorer with 12 goals and 26 assists for 38 points. Brian Babbitt has 21 goals and 16 assists for 37 points. Among the team’s bad boys, George Catrall is leading in penalty minutes with 64. Imonti and Levi Wegleitner each has 60 penalty minutes. If you can’t make it to the Park City Ice Arena this weekend, how about Las Vegas in April? The Pioneers are scheduled to defend their Mountain West Hockey League championship there in the league tournament April 11-13. Imonti said he expects their toughest competition to come from the Vail Yeti. Also playing in the six-team tournament will be teams from Aspen, Salt Lake City, Las Vegas and San Diego. There aren’t many people who come away from Las Vegas on a winning streak. The Park City Pioneers hope to be among the select few.